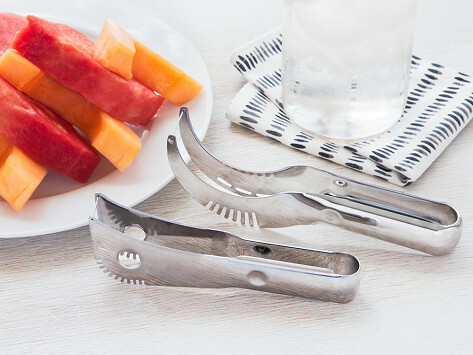 With a pair of these melon slicers in your kitchen arsenal, you’re prepared to slice and serve jumbo watermelons and pint-sized cantaloupes with ease. Both tools slice, lift, and serve in one easy motion. All you’re left with are empty rinds, less mess (we’re looking at you, watermelons), and perfectly cut pieces of melon. Dimensions: Melonello: 7.5" x 2.5" x 1.5"; Angurello: 8.5" x 2.5" x 1.5"
Everyone at Church loves this watermelon cutter. Works Great. We love to use this when we have our Church watermelon cutting!!! This really makes fast work of slicing up watermelon. The family loves eating melon, sometimes it’s too plain messy. This innovative tool makes it simple.